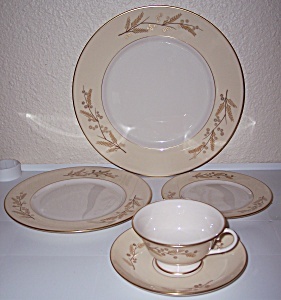 THIS IS AN OFFERING PRISTINE FRANCISCAN POTTERY MASTERPIECE CHINA ACACIA PLACE SET CONTAINING 10-3/4", 8-3/4", 6-3/8" PLATES AND A CUP & SAUCER WITH LOVELY GOLD DECORATION. GOLD FRANCISCAN MASTERPIECE CHINA MADE IN U.S.A. ACACIA MARKS. NOT A HINT OF USE AND HAS NO NICKS, CHIPS, CRACKS OR REPAIRS. SHIPPING FOR THIS FINE ADDITION TO YOUR COLLECTION IS $9.95.